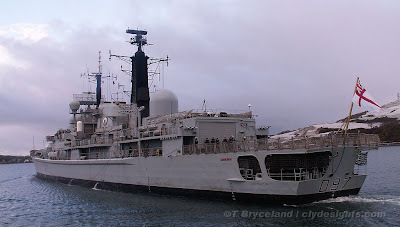 The Type 42 destroyer EDINBURGH paid a brief visit to the Clyde on Thursday, and was seen here arriving at Campbeltown, where she berthed alongside the NATO jetty on the south side of the loch. Later noted in the Largs Channel before heading back out to sea, her visit to the Clyde was for navigation training purposes. EDINBURGH visited Glasgow last November for a few days.